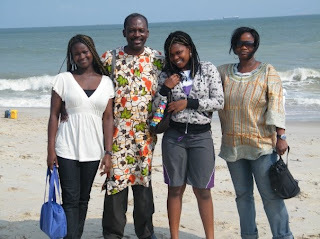 Just made a trip back from the great country Nigeria, in West Africa for those who don’t know. Went with my whole family of 4 for 2 reasons to celebrate my father’s birthday and have a short holliday. I must say that I was pleasantly surprised and actually enjoyed the stay better than previous visits. My daughters will echo that sentiment. I decided to play tourist this time and was snapping happy with my new camera. The last time I visited was about 3 and a half years ago. This time the passage through immigrations was quite smooth. 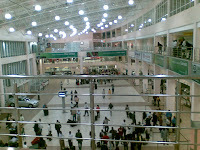 I visited 3 cities ; Lagos (the commercial capital), Akure (upcoming city in teh west) and Abuja (the country’s capital). As much as I would have liked to do the public transport, extended family and friends arranged for vehicles to take us around which has it’s merits: air condition, and not having to pay :-).The only exception was the hire of the hotel cars (the drop) that are charged per hour. We stayed at 3 different hotels. 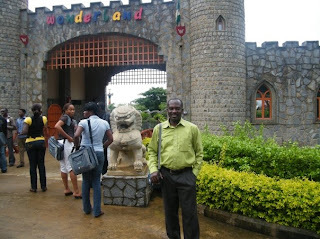 African Garden Lodge in Lagos, Owena Motels in Akure and Angeles Hotel, Garki, Abuja. There seems to be a great effort to make places easier to find. Streets have been properly names and sign posted. New bus systems seem to be running. Traffic lights in place and actually working and being obeyed ! ATM machines all over. I actually dared to use them and did 4 times with my Visa card and got money every time. All this in Lagos and other cities as well. Not all perfect but should be commended. We visited the Bar beach( restored)nice and watched a film at Silverbird Galeria, Vistoria Island. I actually made reservations from abroad for the 3 hotels. And it all went well bar one. Owena motel messed up. My booking for the 20th of July was set in June 20 in error, so we had to make do with 2 rooms in place of the suite as requested. Wierd, as I have never had to make a reservation with them before, and always walked in a got the desired room. Hotel food as usual was expensive, so we ate out at times, and that’s no problem with more chique restaurants like Tantalizers eager to serve you with a range of snacks and rice, pasta and traditional Nigerian meals. and book flights online, except that my ‘foreign’ visa and mastercard were not accepted, so I had to get a Nigerian friend to do it with his card and paid him back. And indeed, you pay much less by booking online. compare 8000 Naira one way to 16000 Naira for the same flight on the day !Did I talk about the new regional/local airport called MM2. It’s beautiful. My kids loved the look. It’s modern and has good shops and eating facilities and working toilets. Nice. It’s looking better than the international even! Is this in Nigeria ? Questions my kids were asking. Being a new city relatively and a bit of good maintenance, had good roads, less traffic. Beautiful houses. Driving to the City centre, you see a skyline that reminds you of Atlanta, Georgia! Hope, this beauty spreads around. We went to an attaction part Wonderland and had fun. Visited the arts and crafts village and saw the usual beautiful craft. Thankfully I have learnt to bargain, got some good deals. English football/soccer has a strong foothold here. Got a calabash with my fav club Arsenal hand painted. Now in a pride of place in my sitting room. Working in progress. Roads in Lagos are stil BAD, with loads of portholes. On the road from Lagos to Akure, lots of check points. I sat in front and kept a straight face, and we never paid a single bribe to anyone. I wonder . Power cuts. No change, I’m afraid. I hear the responsible body is no longer NEPA, but some Power Holding Company (which gave cheeky people fuel for some interesting interpretations)Mosquitos! Nothing you can do about that. Had our insect repelant on and took the anti- malarials. To be fore warned my old primary scholl teach chanted is to be fore armed .